D. R. Carmichael, O. Ray Whittington, Lynford Graham, "Accountants' Handbook, Volume 1: Financial Accounting and General Topics"
This highly regarded reference is relied on by a considerable part of the accounting profession in their day-to-day work. 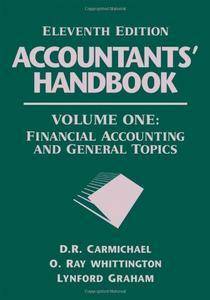 This handbook is the first place many accountants look to find answers to practice questions. Its comprehensive scope is widely recognized and relied on. It is designed as a single reference source that provides answers to all reasonable questions on accounting and financial reporting asked by accountants, auditors, bankers, lawyers, financial analysts, and other preparers and users of accounting information.